Finally! This wall is finish! Started coloring it few months ago, then exams came so had to leave it, then few days ago I started continuing it (I didn't had internet so I finished vector in 2 days xD). I was bit confused about BG, but not having internet made me unable to look for reference, so I searched in my scans folder to see if I've got something good in it. And found this scan. Since Tsuna is already taking so much space plus details so I decided to keep BG minimal without a lot of details (to balance it and preventing to make a crowd in wall). Clouds are just floating steam which were hell to smudge because it crashed my PS for 20 minutes, so had to resize it from 5000xsomething to normal 2560x1600 pixels.Added few stars, and lots of gradients for making the time setting almost night with little wash of sunset. Painting fire was good too, I used dodge tool for first time in my life. xD But I kinda didn't liked the flames around his glove. But I noticed a thing after saving it in jpg format, it had lots and lots of jpg artifacts, too much noise. Probably because tons of gradients I've added. So I duplicated and blurred the entire wall and set the opacity to 50%. It's still not very clean but yeah 50% of it is painted. So this is how I've finished it, Thanks to Shimazaki-san for motivating me. All sort of comments, advice suggestions are welcome by me! Do not repost it without my permission and it must have my signature intact, only for personal desktop use! Do not use it for any commercial purpose! Proposed by and highlighted by elisadevelon. oh! you already finished it! :3 WOOOW! Whoa, I haven't seen KHR walls here for a looong time! And I was really surprised when I saw it on the front page! It also really pops out lol! 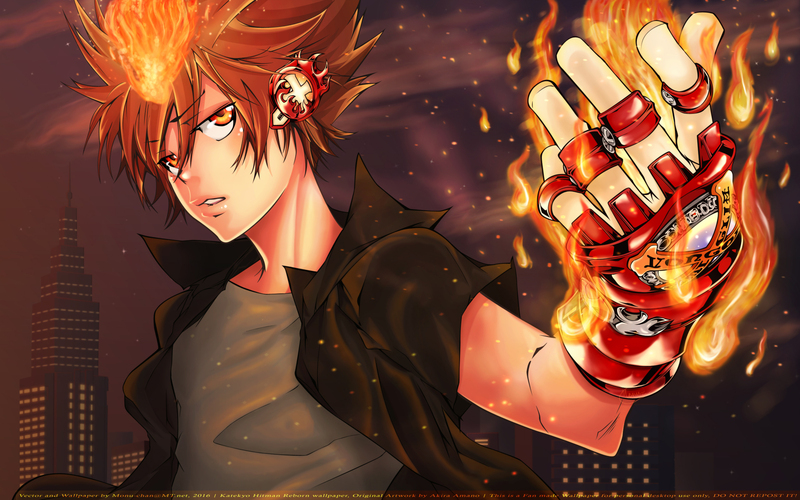 Tsuna baby! I like, like, like. The flames and his hair are really nice. Very nice! I love the quality of the vectoring here, and the soft fiery glow added for lighting. really cool wally! you did a great job! Damn I missed seeing walls from this series, and with fire! Awesome work on the lighting, everything looks very smooth! I must say that you nailed the style this time. Seriously, among all your wallpapers, this is the best. I think these types of scan are your forte~ Hope to see more from you. Agreed about nailing Amano's style; you did an awesome job on that. What I personally like the most on this wall is the hair and the fire. The hair looks very clean and I love the color (pretty much my actual hair color rn). And the fire because it's very difficult to pull off good-looking fire but yours is more that satisfactory. I'd even put even more glow and sparks around it to underline the fiery effect. Regarding the pixelated BG, yes, it's definitely because of too many filters and/or gradients. Happened to me in the past but I battle it by adding noise onto the area after merging all the separate layers. It helps decrease the pixelation and makes the area a little less flat at the same time. Wow... This wallpaper looks awesome Monu-chan XD you did great!